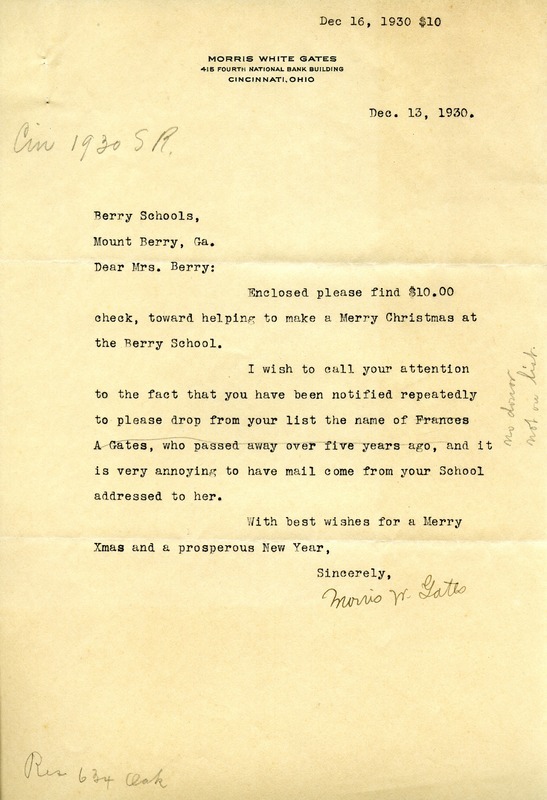 Morris Gates writes Martha Berry to inform her of a $10.00 donation made to The Berry Schools. He also requests the removal of Frances A. Gates from the mailing list because she passed away five years prior. Morris W. Gates, “Letter to Martha Berry from Morris White Gates.” Martha Berry Digital Archive. Eds. Schlitz, Stephanie A., Meg Ratliff, Chelsea Risley, Emilee Sargent, et al. Mount Berry: Berry College, 2013. accessed April 21, 2019, https://mbda.berry.edu/items/show/12610.